Real-time merging of DVB-S2 Transport Streams from geographically-redundant ground-stations to support European ARISS School Contacts. Operation of Line-of-sight VHF Radio conversations between Schools and Tim Peake on the International Space Station, with Live S-Band Video Downlink. A public LF + VHF + UHF WebSDR run by Noel G8GTZ, Martin G8JNJ, and SUWS. Located on a hill just north of Farnham, Surrey, UK. An easy-to-use DX Spotting Cluster for Amateur Television (ATV/DATV) worldwide. ... undocumented flights up to November 2016..
6th April 2014 - POPEYE - Raspberry Pi SSDV Live Photos Payload Flew with SUSF from Cambridge. A prototype of my POPEYE Raspberry Pi SSDV Live Pictures payload was demoed in the talk. Planned Launch Cancelled due to bad weather. Providing advice and technical reference to the RF Comms Project Students when needed. 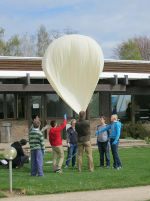 Also assisting in design and construction of the University's Satellite Ground Station with SUSF. 3D Printed part allows injection of 3.9V External power into the camera, for operation off power supply or larger battery pack. Thanks to SoMakeIt for the use of their 3d printer! 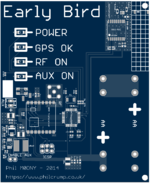 Final PCB Layout sent off to the DirtyPCB Fab for the 'Early Bird' HAB Tracker. Most advanced yet with Filtered GPS, LoRa RF Transmitter, and up to 15V Auxiliary Boost Power Supply. New boards for my cheap AVR-based Temperature/Humidity Wireless Sensor nodes. These boards provide an easily-solderable base on which to build a UKHASnet sensor, repeater or gateway. I've ordered plenty so let me know if you'd like one! More information on the UKHASnet Wiki. 31st August - 65km Packet Range achieved with UKHASnet HAB Node! 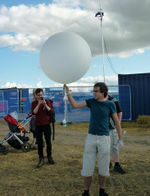 We flew a small latex balloon with several experimental payloads from EMFcamp near Milton Keynes that floated south and popped over France. 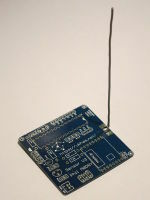 POPEYE Raspberry Pi Live Images (SSDV) Transmitter was flown with the Southampton University Spaceflight Society up to 37.8km. This page was last modified on 23 April 2017, at 12:11.